Richard Kennedy is a member of the Kennedy Family. They have no relation whatsoever to John F. Kennedy, Bobby Kennedy, etc. Richard’s parents were Raymond and Cindy Kennedy. His grandfather was Alex Kennedy. Richard’s family was instrumental in the creation of New Edmonton City. They were also involved in the creation of the Allies, the Super Team and the Super Hero Council that operates in New Edmonton City. Richard’s parents encouraged him to be a high achiever. Although he only maintained average grades throughout school he was a star quarterback on his high school football team. Richard began to show signs of superpowers in his later teen years and had to quit football. Every football league in the country has rules barring superpowered players. Richard’s family encouraged him to get a superhero license and they helped Richard form the superhero team The Super Team. Richard got his lead license soon after and became the team leader. Richard chose his superhero name: Captain Uniteus. Normally Super Hero Council rules dictate that in order to use the word “Captain” in your superhero name you have to have at least reached the rank of Captain in the New Edmonton City military. This rule was bent however to allow Richard to use it. The reasoning being that he was captain of his football team. Richard has never been married. This has caused many rumours that have been expounded in the New Edmonton media. Richard has also had problems with alcohol addiction that have been made public. 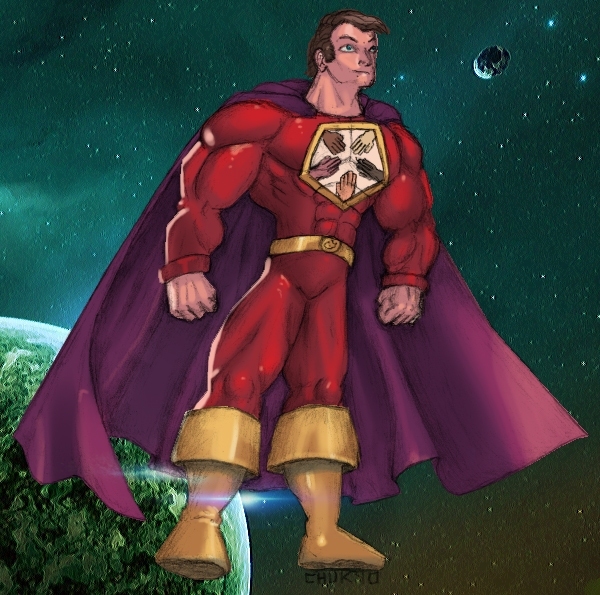 Captain Uniteus is considered to be the most powerful superhero in the city. He also wields lots of political power. No one has pointed out to Captain Uniteus the ridiculous way in which his name is spelled.